46,131 prs of Anti-Ballistic eyewear provided up to date. As of January 1, 2018, Armor 4 Troops Foundation is proud to announce it has delivered or shipped directly to our American troops in the field, Forty Six Thousand One Hundred Thirty One (46,131) pairs of protective anti-ballistic eyewear, in addition to multi-function tools, Under-Armour, anti-bacterial socks, compressed rubber boot pads, elbow pads, knee pads and many other sundry products to improve the quality of life to our troops. We are proud to say that over 98.83% of all donations received are used in support of our American Troops. All our staff members are non-paid volunteers who do this for their love of the United States and the freedoms we all enjoy. FREEDOM IS NOT FREE !! *Note: The last names of our American troops have been withheld on correspondence received by the Armor 4 Troops Foundation and published on this website for security reasons. 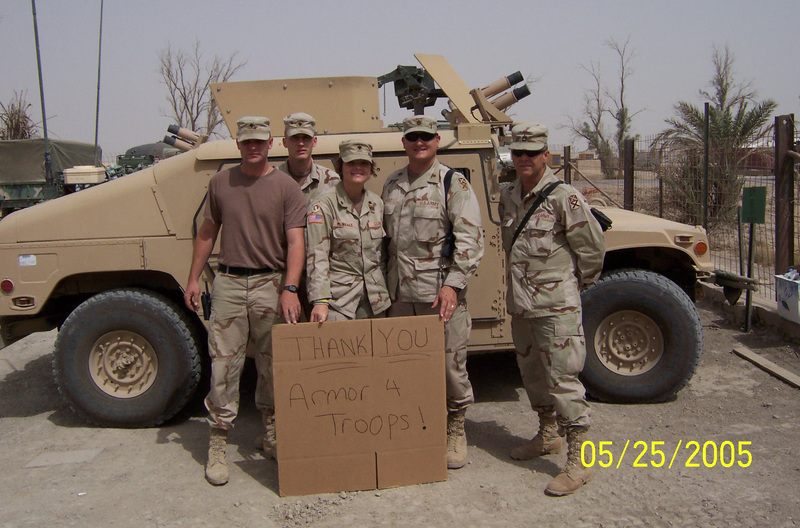 Armor 4 Troops Foundation would like to thank Krause Family Ford, Woodstock, GA. for their most generous donation. 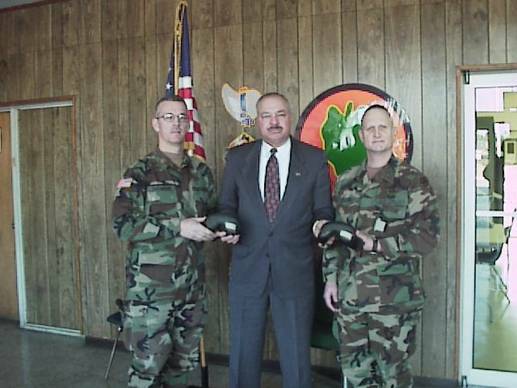 Pictured from left: LtCol. R. Ledee and Ryan Butterfield, General Manager. Armor 4 Troops Foundation would like to thank Briggs Equipment for their most generous donation. Pictured from left: Paul Walker, LtCol. R. Ledee, Mike Kenyon, Rebecca Johnson, Sabrina Robinson. I wanted to send a message out to everyone that has been there to support my platoon while we were deployed. This past few months has been rough, and unfortunately we've had some casualties during out tour here in Afghanistan but I wanted to thank every one of you for the packages that we have received. We move a lot and there has been months were we have had to live out of just our rucksacks or trucks. It was a great morale boost for everyone to get mail and with everyone that sent us something I want you to know that sometimes one of my soldiers wouldn't receive mail from home, but I was always able to make sure they all got something thanks to you. Sometimes I would put a box in my truck or in my rucksack and when we got a few minutes of peace during a mission I would break it out and share everything that you were kind enough to send us. Also soldiers from other platoons or troops would sometimes move through our outpost for a place to rest shortly before continuing mission. With your support I was always able to give a few things to them to make their day better and help them with anything they may have lost or forgotten to pack. We should be returning home soon so although we greatly appreciate everything sent, they will soon be stopping all the mail to our unit. If you have items to send us still I encourage you to contact one of agencies and send these much needed items to another soldier somewhere who needs it most. Thank you from myself and all the soldier of 2nd Platoon Bravo Troop 4-4 Cav "Prepared and Loyal"
Armor 4 Troops Foundation would like to thank the National Rifle Association (NRA) for their support and confidence. NRA and Armor 4 Troops Foundation are working together on promoting the project to raise money for the purchase of this much needed equipment for our troops fighting overseas defending our Freedoms and way of life. Please see the American Rifleman May 2011 magazine (pg 26) for the announcement. LtCol R. Ledee and Armor 4 Troops Foundation were honored honored by Ford Mustang Club of America at their semi-annual auto show, held in conjunction with Summit Racing. Pictured are Donny Brown, Event Director and Leonard Archer, President. We are very grateful for the support and look forward to our continuing relationship. LtCol R. Ledee and Armor 4 Troops Foundation honored Mr. Joseph Smith, Georgia Show manager for the RK Shows Organization, for their continued support for the foundation and our American troops. RK Gun Shows are held monthly in Georgia in many different locations and many more are in the planning stages. LtCol. 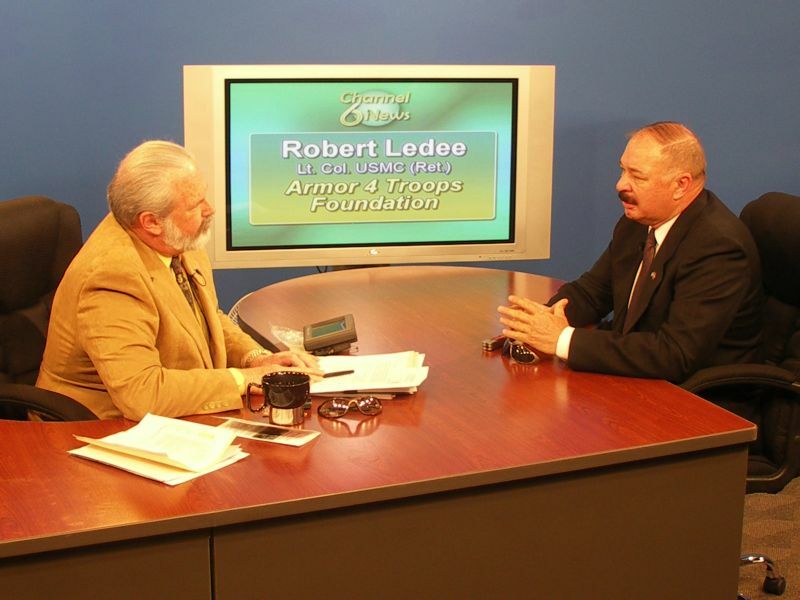 Robert Ledee, Executive Director of Armor 4 Troops Foundation, wants to personally thank Gov. 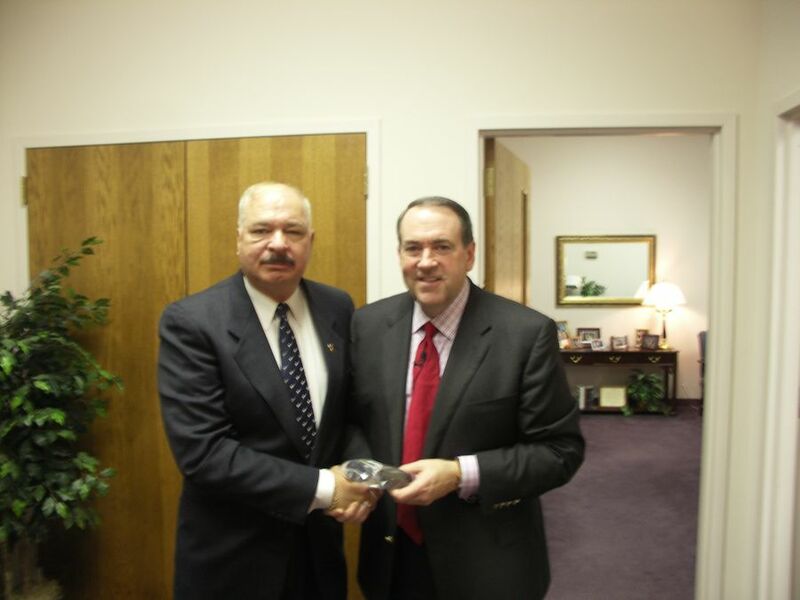 Huckabee for his strong support of our American troops. LtCol Ledee presented a pair of the Anti-Ballistic eyewear which is provided to our military troops overseas who are fighting for our Freedoms and way of life. The Mayor will continue to provide future guidance to our foundation. LtCol. 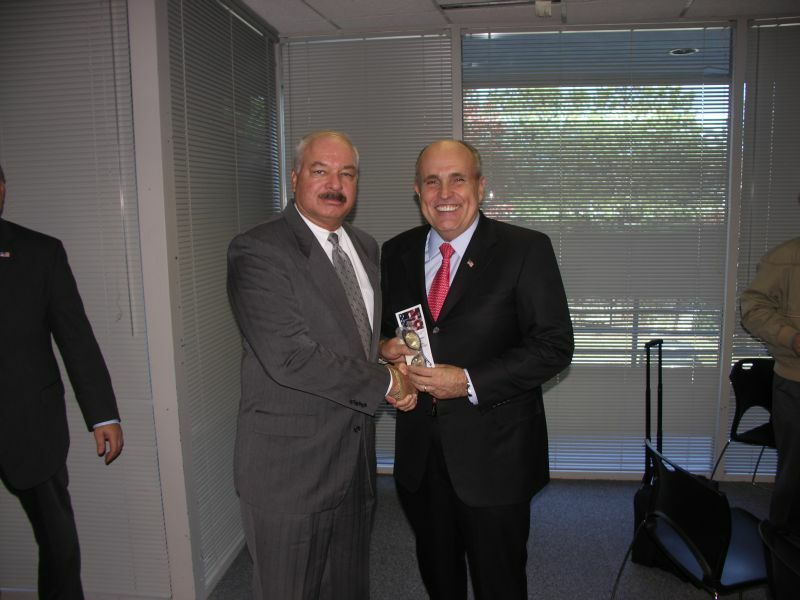 Robert Ledee, Executive Director of Armor 4 Troops Foundation, wants to personally thank Mayor Rudy Giuliani for his strong support of our American troops. LtCol Ledee presented a pair of the Anti-Ballistic eyewear which is provided to our military troops overseas who are fighting for our Freedoms and way of life. The Mayor will continue to provide future guidance to our foundation. LtCol. 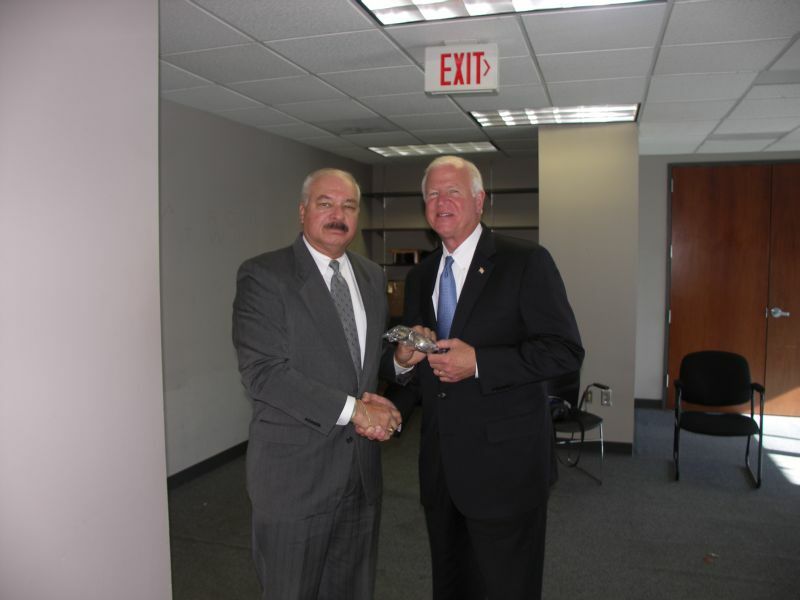 Robert Ledee, Executive Director of Armor 4 Troops Foundation, wants to personally thank Senator Saxby Chambliss for his strong support of our American troops. LtCol Ledee presented a pair of the Anti-Ballistic eyewear which is provided to our military troops overseas who are fighting for our Freedoms and way of life. The Senator has been a long time supporter and friend of A4T Foundation. LtCol. 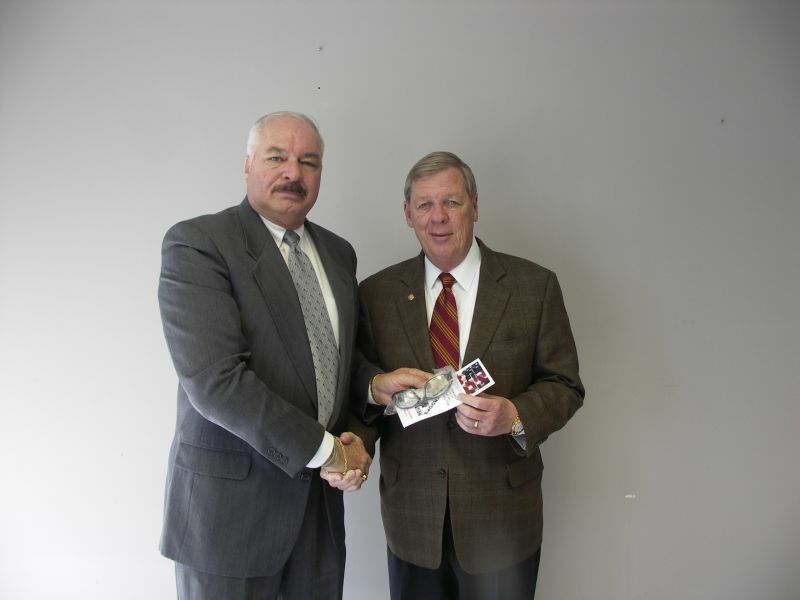 Robert Ledee, Executive Director of Armor 4 Troops Foundation, wants to personally thank Senator Johnny Isakson for his strong support of our American troops. LtCol Ledee presented a pair of the Anti-Ballistic eyewear which is provided to our military troops overseas who are fighting for our Freedoms and way of life. Senator Isakson has been a long time supporter and friend of A4T Foundation. LtCol. 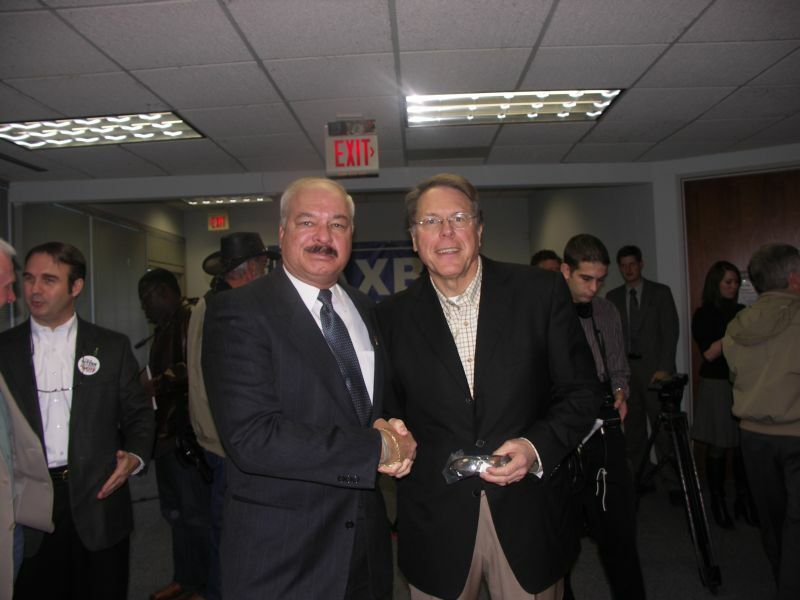 Robert Ledee, Executive Director of Armor 4 Troops Foundation, wants to personally thank Mr. Wayne LaPierre, Exec Vice President National Rifle Association (NRA) for his strong support of our American troops. LtCol Ledee presented commemorative pair number 30,030 of the Anti-Ballistic eyewear which is provided to our military troops overseas who are fighting for our Freedoms and way of life. NRA and A4T have established a future working relationship for the benefit of our troops. LtCol. 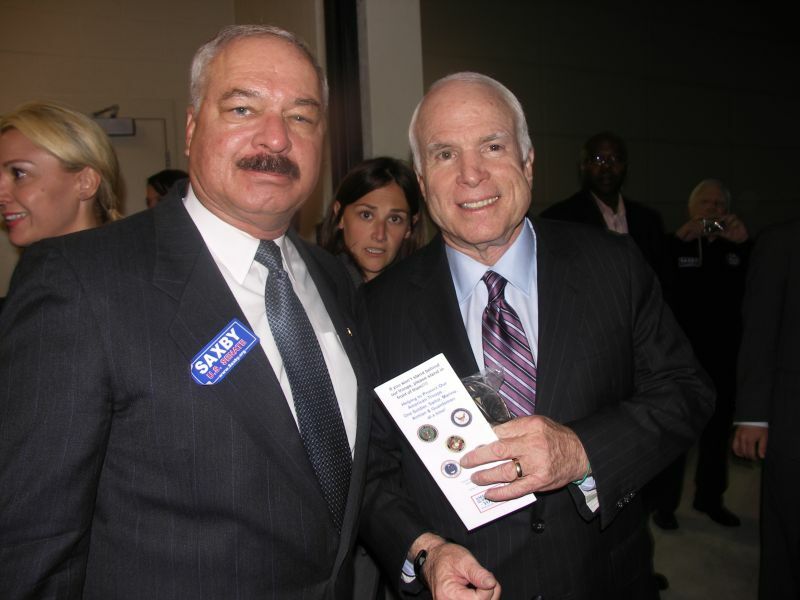 Robert Ledee, Executive Director of Armor 4 Troops Foundation, wants to personally thank Sen. John McCain for his strong support of our American troops. LtCol Ledee presented commemorative pair number 30,000 of the Anti-Ballistic eyewear which is provided to our military troops overseas who are fighting for our Freedoms and way of life. LtCol. 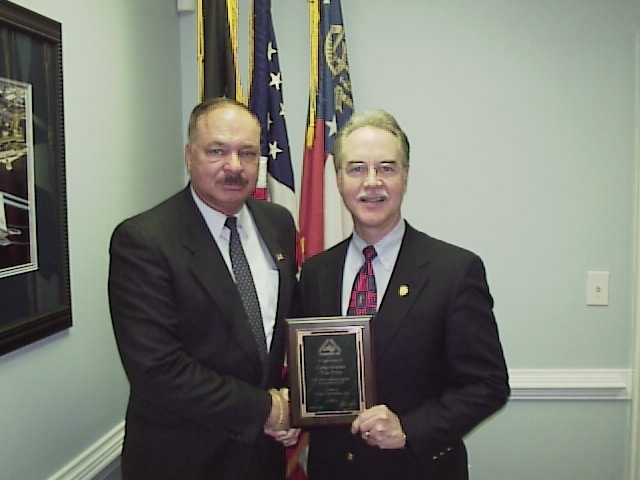 Robert Ledee, Executive Director of Armor 4 Troops Foundation, wants to personally thank Mr. John Oxendine, GA Sate Insurance Commissioner, for his strong support of Armor 4 Troops Foundation. LtCol Ledee presented commemorative pair number 29,000 of the Anti-Ballistic eyewear which is provided to our military troops overseas who are fighting for our Freedoms and way of life. 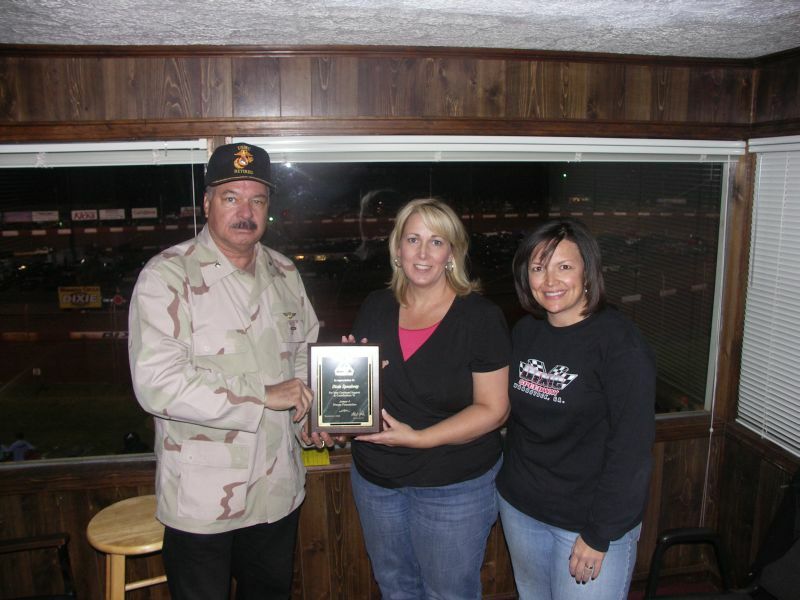 Armor 4 Troops is proud to present a plaque to Mrs. Debra Swims and Mrs Mia Green, representing Dixie Speedway in Woodstock, GA. Dixie Speedway has been a long and loyal supporter of Armor 4 Troops Foundation and our American Troops. We invite you to visit the many great stock car races every Sat night between Mar-Oct yearly. 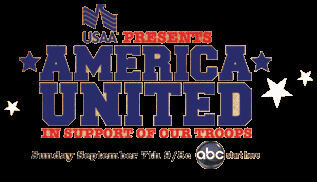 Armor 4 Troops Foundation would like to thank ABC and USAA Insurance Company for their support of our troops. Armor 4 Troops Foundation was honored and selected to be one of the thirteen non-profit foundations featured in this two hour "prime time" special. We thank all of the many who have made and will make tax exempt donations to our foundation. My name is Lcpl Minick, I am in 1st Bn 9th Mar Div, I received a pair of your anti-ballistic sunglasses not too long ago. I was on patrol one day, and we hit an IED, These glasses saved my eyes, and maybe my life. Thank you so much for these glasses! Hi my name is Lcpl Greene, I am in Ramadi Iraq, and I recieved a pair of your ballistic glasses several weeks ago. I love these glasses, they are great during the day because they block the UV rays, and they work good at night as well with the night vision goggles, Thats hard to find, also, they are very easy to clean. Thank you for these glasses! 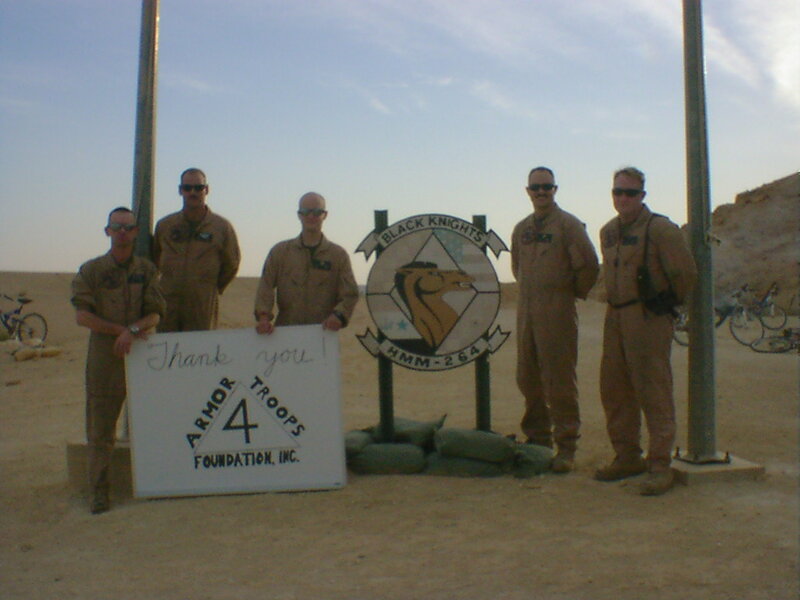 Armor 4 Troops Foundation and LtCol. Robert Ledee, Executive Director of Armor 4 Troops Foundation, were honored by the Sportmans Teams Challenge at their annual shooting competition in San Antonio, TX. LtCol. 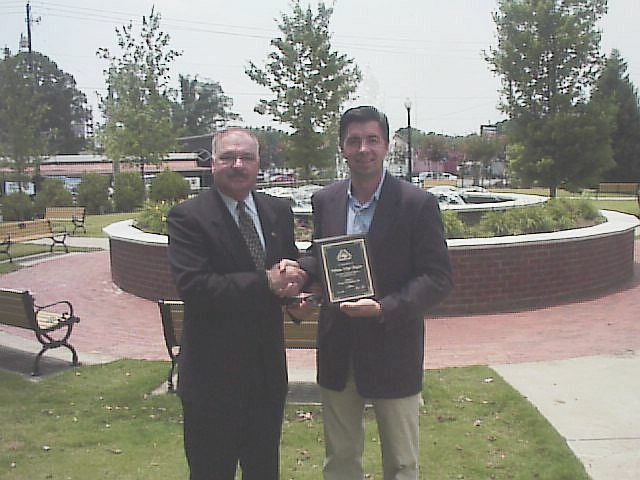 Robert Ledee, Executive Director of Armor 4 Troops Foundation was honored by the City of Roswell, GA Rotary Club as the Guest Speaker at the 11th Annual Memorial Day celebration. Over 5,000 attendees enjoyed themselves in the celebration. Pictured is LtCol. R. Ledee, Guest Speaker and Mr. David Young, committee member. LtCol. Robert Ledee, Executive Director of Armor 4 Troops Foundation, wants to personally thank and expressed his appreciation to Mr. Steve Walsh for the opportunity of appearing on CNN Webcast regarding wounded veterans health care. LtCol. Robert Ledee, Executive Director of Armor 4 Troops Foundation, wants to personally thank and expressed his appreciation to Mr. Rob Merritt and Channel 6 in California for the opportunity of appearing on his television show in support of our troops. LtCol. 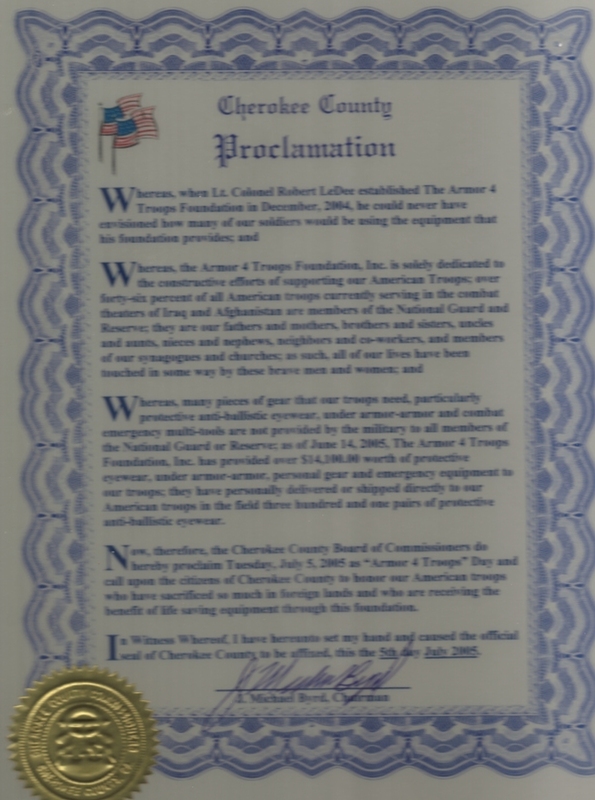 R. Ledee and Armor 4 Troops Foundation are honored at the American Legion for their support of our American Troops. Armor 4 Troops Foundation is honored at the annual National Shooting Sports Foundation Shot Show in Las Vegas Convention Center. LtCol Ledee presented a plaque for their support to Mr Doug Painter, Executive Director and Ms. Jeanette Mannuzza, Operations Manager. LtCol. Robert Ledee, Executive Director of Armor 4 Troops Foundation, wants to personally thank and expressed his appreciation to Sean Hannity and Alan Colmes for the opportunity of appearing on Hannity & Colmes Fox News show. 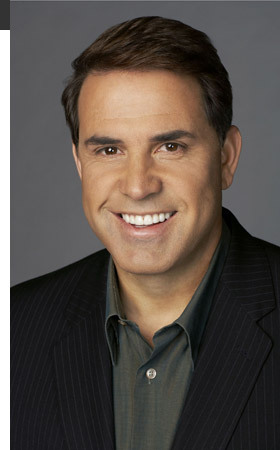 Fox News personalities are strong supporters of Armor 4 Troops Foundation. LtCol Ledee presented commemorative pair number 15,000 of the Anti-Ballistic eyewear which is provided to our military troops overseas to Sean Hannity and commemorative pair number 15,001 to Alan Colmes in New York. LtCol. Robert Ledee, Executive Director of Armor 4 Troops Foundation, wants to personally thank and express his appreciation to nationally acclaimed radio personality Moby in the Morning, 107.1 FM Atlanta for the many opportunities of appearing on his show. 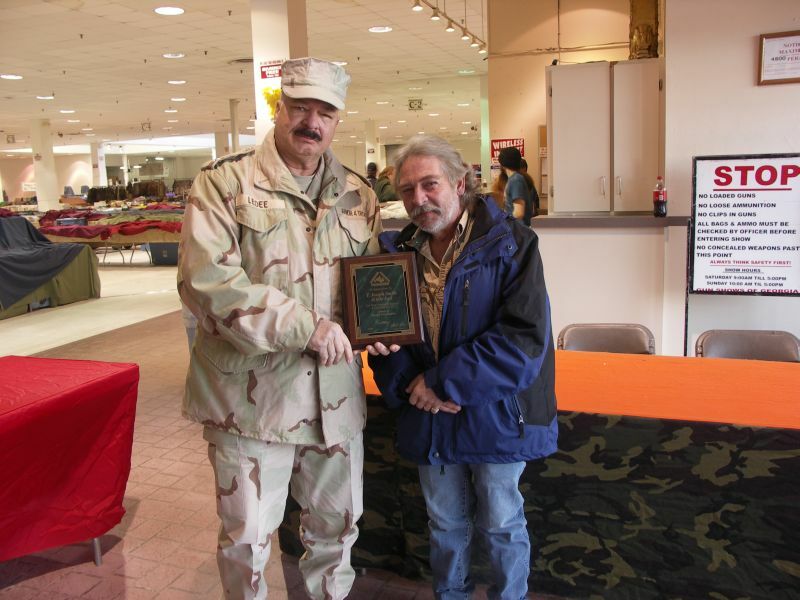 LtCol Ledee presents a plaque to Moby for his continued support and dedication to protecting our troops. 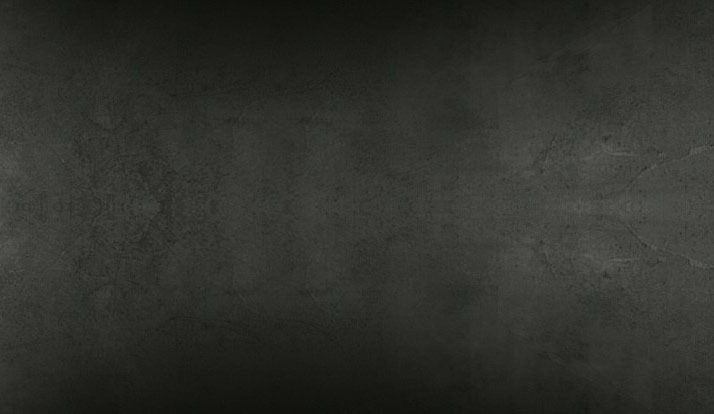 We just received your shipment of 15 pairs of anti-ballistic eyewear... YOU GUYS ROCK! Thanks so much for hooking up my mechanics. Since these are high-dollar items, they're hard to come by and the pairs that we were issued during pre-deployment training are already trashed (6-months later). So it was extremely nice to receive your groovy glasses! They fit perfectly on my noggin! All the guys really know they fully cover your orbital area. Thanks so much for all that you're doing for us over here. We truly appreciate it. generosity and providing us a great product. LtCol. R. Ledee, Executive Director, is proud to announce the crossing of the monumental figure of 10,000 pairs of Anti-Ballistic Eyewear provide to our fighting men and women in Iraq/AFG who are risking their lives in defense of our freedoms and security. We thank all who have made those very generous donations, continued support and sponsorships. We are the only organization providing equipment to our troops. Most people don't know that some Air Force personnel are providing security for the convoys here in Iraq. Today we hit an IED and had some injuries. I had a piece of shrapnel bounce off my right eye. If I didn't have the glasses you all provided, I would have been blind or dead. Thank you so much for all that you do and pass this along to others. I've told all my family and friends to go to your website and make a donation. If I had a million dollars, I would give it to you guys. 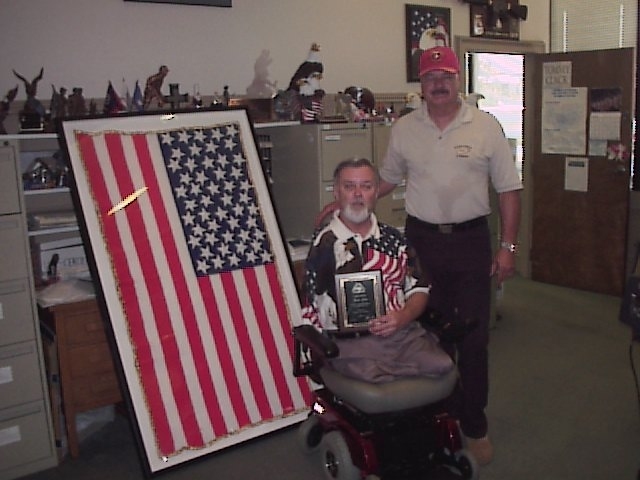 You saved my eyes so I can see my 1 year daughter when I get back in Dec.
LtCol Robert Ledee, Executive Director of Armor 4 Troops Foundation proudly presented to Mr. Tommy Clack, 1 of 3 Viet-Nam Triple amputees, with a Power Chair. 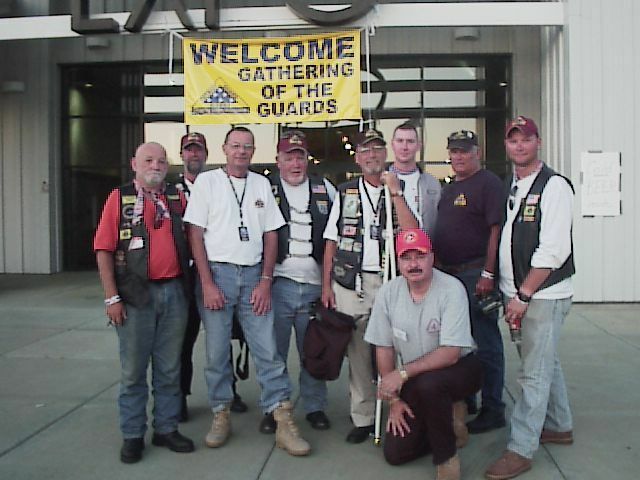 Mr Clack continues serving his country as the Manager of the Veterans Service Center in Conyers, GA.
LtCol. Robert Ledee, Executive Director of Armor 4 Troops Foundation, wants to personally thank and expressed his appreciation to Rick Sanchez, anchor at CNN for the opportunity of appearing on his show. Armor 4 Troops Foundation receives the largest product donation from WileyX Eyewear, a major corporate supplier to our American troops. This is the second large donation received this year from WileyX Corporation. We thank them and are very grateful for their continued support. I'm a Corporal in the USMC, we protect every convoy that rolls out from any base that we can get to. 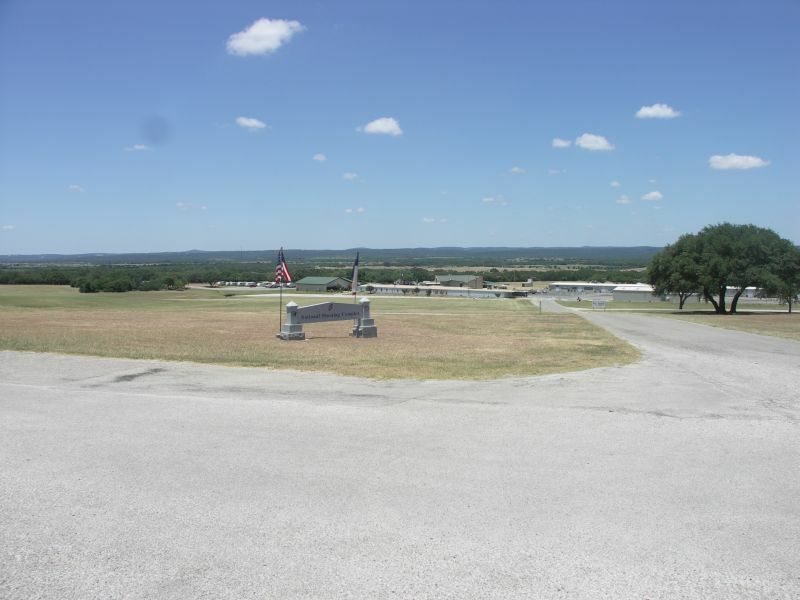 We even support civilian contractors moving through the country. All the Marines are all volunteer Marines who asked to be in the Security Company. There are no sad faces here, no one saying why are we here, or asking to not go to fight the insurgents trying to take our live and have caused others to fall so bravely. We simply ask that you support us and not to give up on us or on the belief that Americans can’t fight or that they won't fight. We Marines, Sailors, Airmen, Soldiers, Coast Guards, and Civilian Contractors are fighting for you and giving our lives for your freedoms. We say thank you for what you do for us and hope you will not let us down while we fight for you. The Marines haven’t lost sight of what were doing over there and we hope you haven’t either. LtCol. Robert Ledee, Executive Director of Armor 4 Troops Foundation is proud to present to Mr. Chris Jacobs, Overhaulin TV show co-host, pair number Five Thousand Five Hundred (5,500) of the protective Anti-Ballistic eyewear which is being provided to our American troops. Picture with LtCol. Ledee and Chris Jacobs is Mr. Jay Purpura, President of Muscle Car Reproductions, a staunch supporter of our American troops and Armor 4 Troops Foundation. 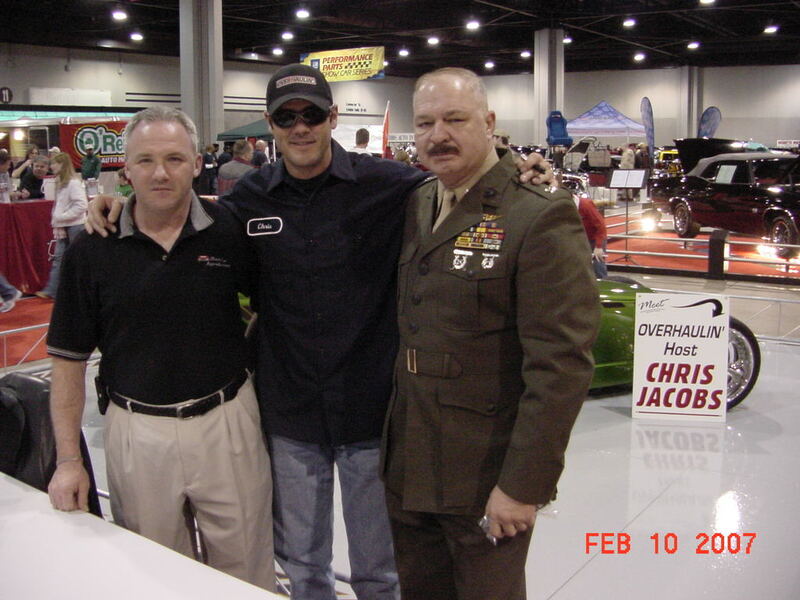 LtCol Ledee was an honored guest at the annual World of Wheels Auto Show in Atlanta, GA.
LtCol. Robert Ledee, Executive Director of Armor 4 Troops Foundation, is proud to present to GySgt. 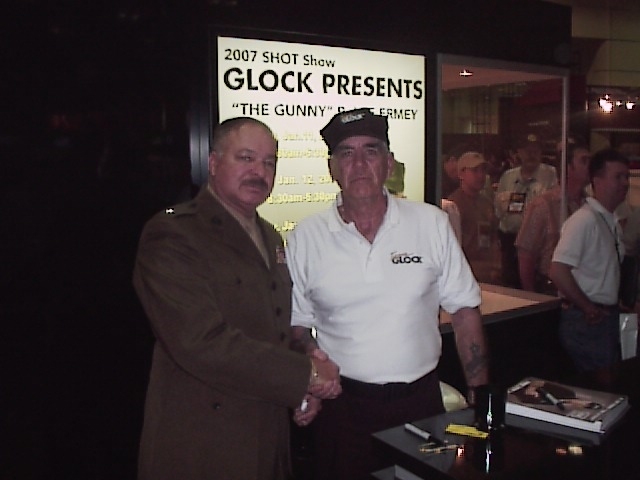 R. Lee Ermey, USMC and Mail Call TV show host in addition as the spokesman for Glock Firearms, pair number Five Thousand Three Hundred (5,300) of the protective Anti-Ballistic eyewear which is being provided to our American troops. GySgt Ermey has been a long time supporter of our troops and a great American. LtCol Ledee and GySgt Ermey have been friends for the last three years. 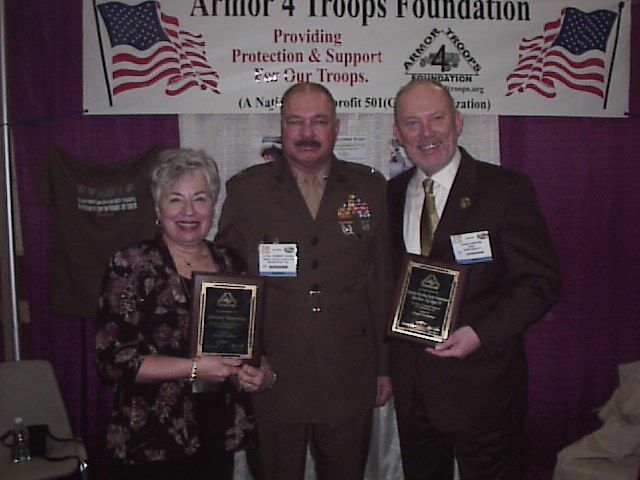 Armor 4 Troops Foundation was honored as an invited guest to the 2006 Shot Show in Orlando, FL presented by the National Shooting Sports Foundation, Inc (NSSF). We are very proud and humbled by the generosity and accolades showered upon our foundation by the many members of the organization and the firearms/sports industry. 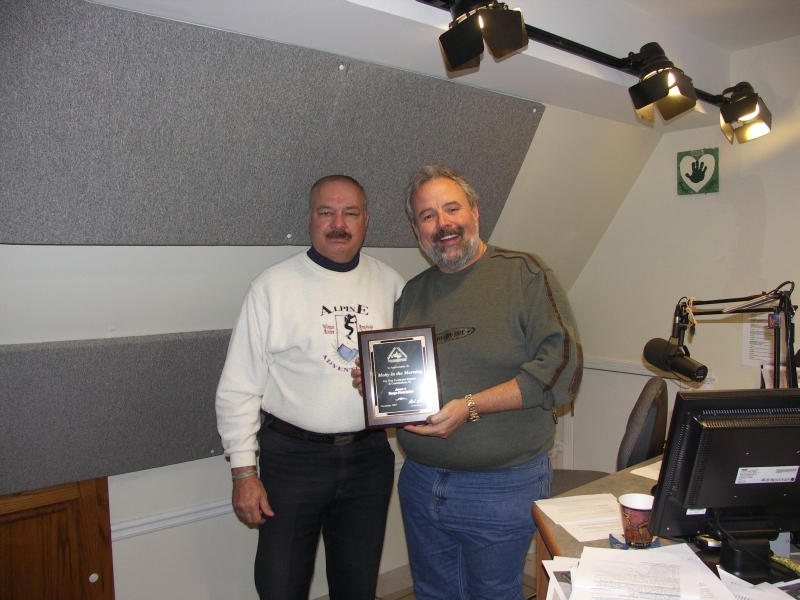 Presenting a plaque to Mr. Doug Painter, President, for their support and contribution is LtCol. 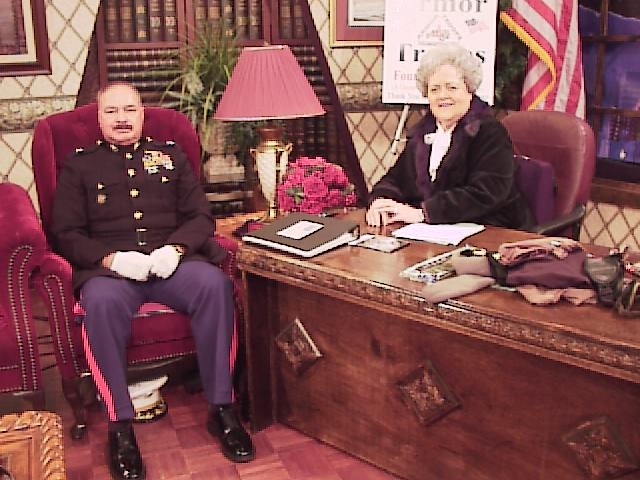 R. Ledee, USMC, Executive Director and Mr. J.D. Carpanzano, Board Member. 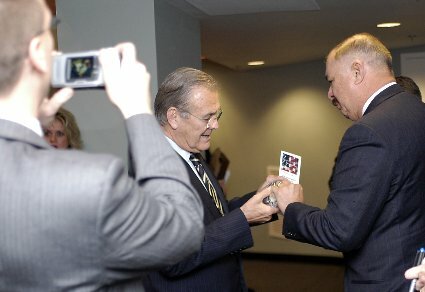 Armor 4 Troops Foundation surpassed 5,000 pairs of Anti-Ballistic Eyewear provided to our troops fighting the war on Terrorism in 2006 with the presentation of the commemorative pair to Secretary of Defense Donald H. Rumsfeld during a briefing at the Pentagon. Our goal for 2006 was 5,000 pairs of eyewear and other equipment. Our administrative expenses were less than 4%. Our goal for 2007 is 10,000 pairs of the Anti-Ballistic eyewear. We are committed to preserving the eyesight of our troops so they can continue to see and enjoy the freedoms which they have so valiantly fought for. Armor 4 Troops Foundation surpasses the 4,000 th pair of Anti-Ballistic Eyewear provided to our troops with administrative expenses of less than 3%. Our goal for 2006 is 5,000 pairs of eyewear and other equipment. 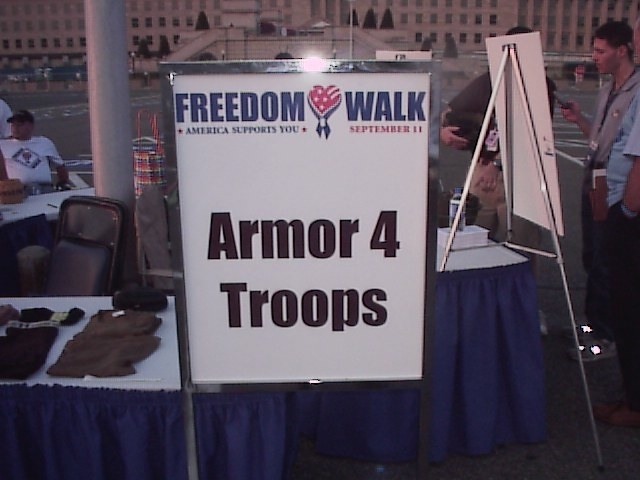 Armor 4 Troops Foundation was honored by being one of the few charitable organizations invited and attending the AmericaSupportsYou.mil Freedom Walk held at the Pentagon in Washington, DC. in tribute to the many Americans who died in the 9/11 attack. Armor 4 Troops Foundation Executive Director, LtCol. Robert Ledee, USMC (retired) honored Gen. Peter Pace, USMC, Chairman of the Joint Chiefs of Staff by presenting honorary pair 3,500 of the protective Anti-Ballistic eyewear which are furnished to our American Troops fighting the war on Terrorism in support of our great country. Armor 4 Troops Foundation Executive Director, LtCol. 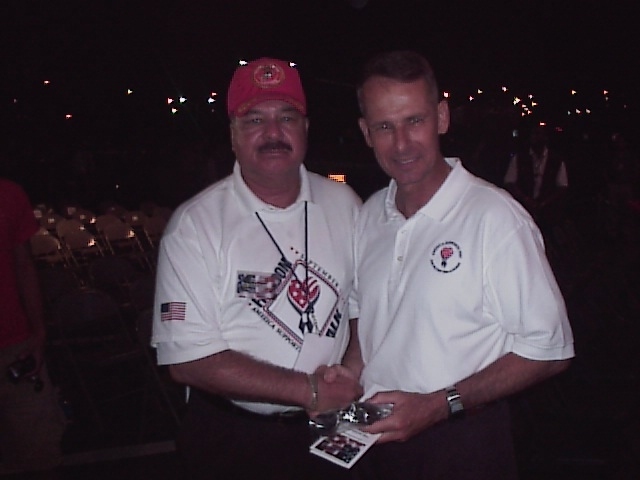 Robert Ledee, USMC (retired) and Board Member J.D. Carpanzano, honored ADM Edmund P. Giambastiani, Vice Chairman of the Joint Chiefs of Staff by presenting honorary pair 3,501 of the protective Anti-Ballistic eyewear which are furnished to our American Troops fighting the war on Terrorism in support of our great country. I wanted to take a moment to thank you for your thoughtful giving and time spent on supporting my team during the trying time of this deployment. Charity is a dying trait in this life, and I greatly appreciate your selflessness. I thought I would share with you a piece of my world, perhaps it will warm your heart, at the very least maybe you’ll smile. I was born on July 6, 1978, ironically on July 6, 2006 is when I received your parcel. Your contribution to my welfare was a beautiful spectacle, separate from the ugliness of isolation that I have been enduring for the past several months. It’s amazing how one box can reshape a man’s perspective so easily, if not just for one day, in this case my birthday. Thank you, and thank you for all the support you show my brothers and sisters in arms. I am a soldier currently deployed in support of Operation Enduring Freedom who works with SSG Jimmy E. Yesterday we received the care packages you sent to us. They contained many useful things for us to use out here. And I wish to thank you for your kind support. It is nice to know that people do truly care for us out here as we are away from home doing our job as soldiers in the US military. I appreciate the time and support you have shown us out here. Armor 4 Troops Foundation surpasses the 3,000 th pair of Anti-Ballistic Eyewear provided to our troops with administrative expenses of less than 4%. Our goal for 2006 is 5,000 pairs of eyewear and other equipment. LtCol. Robert Ledee, President of Armor 4 Troops Foundation, is proud to present to GA State Senator Chip Rogers pair number Two Thousand Five Hundred (2,500) of the protective anti-ballistic eyewear which is being provided to our American troops. 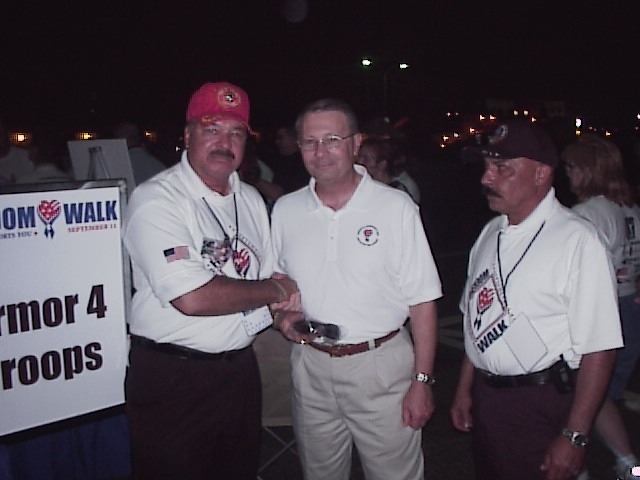 Sen Rogers has been a long time supporter of our troops and Armor 4 Troops Foundation. LtCol. Robert Ledee, President of Armor 4 Troops Foundation, wants to personally thank and expressed his appreciation to Steve Doocy, Kiran Chetry and Peter Johnson for the opportunity of appearing on Fox & Friends early morning show in New York City. Armor 4 Troops Foundation surpasses the 2,000 pairs of Anti-Ballistic Eyewear provided to our American troops. Thank you for the packages you sent to my platoon and me. I am giving the eyewear to my platoon Sergeant so he can hand them out to the rest of the platoon. The other box I'm sharing with my squad. It's nice to have another pair of the anti-ballistic eyewear cause many of us lose or break them. In fact, I know that these glasses work cause we recently had a soldier hit by an IED who was wearing your ballistic glasses. Well, his truck was hit and he was up in the gun turret. The glasses, to make a long story short, saved his right eye and vision. Thank you again so very much for everything you've done. LtCol. 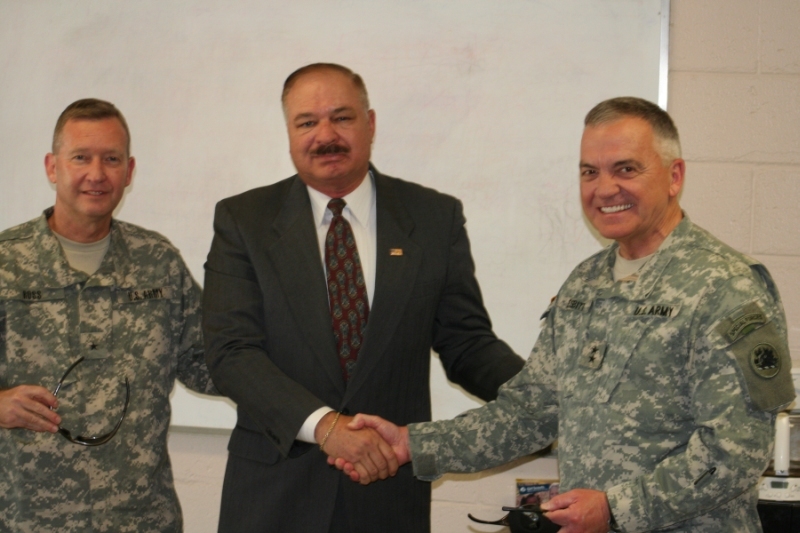 Robert Ledee, President of Armor 4 Troops Foundation, is proud to present to MajGen. Terry Nesbitt, Director, Domestic Operations, pair number Eighteen Hundred (1800) and to BGen. Lawrence Ross, Commander 78thTroop Command of the Georgia Army National Guard, pair number Eighteen Hundred and One (1,801) of the protective anti-ballistic eyewear which we are currently providing to our American troops. Additionally, all 180 members of the unit were provided with a pair of the eyewear. The unit is IRAQ bound. Just the other day I received 100 pairs of anti-ballistic sun glasses. Thank you very much. All of our Air Force airmen are outfitted with them now and we had a few extras to pass to our Army and USMC cohorts here. They came just in time, as our base was hit by another mortar attack the same day I handed out the last pair of glasses. I expect you will be receiving some thank you's. Also, within the month your flag will fly over Abu Ghraib...should have it to you by 1 May. LtCol. 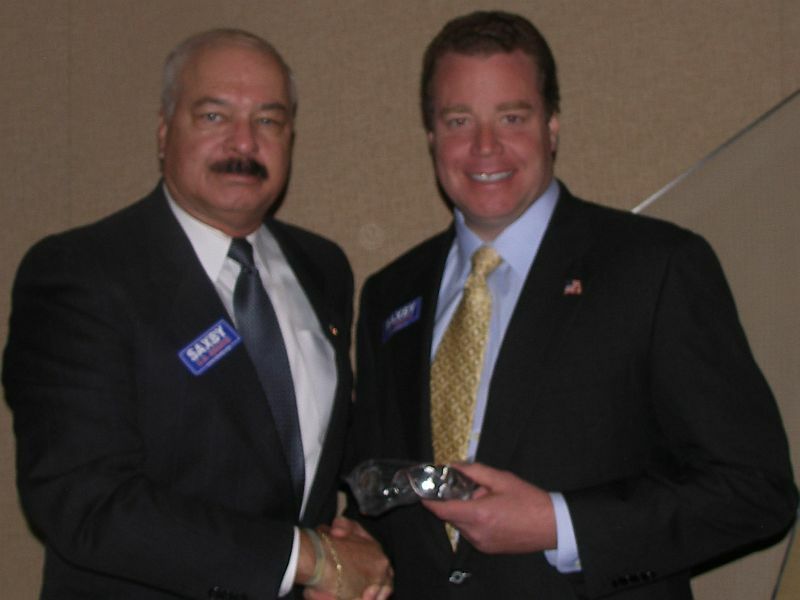 Robert Ledee, President of Armor 4 Troops Foundation, is proud to present to 6th District Georgia Congressman Tom Price pair number Sixteen Hundred (1,600) of protective anti-ballistic eyewear which is being provided to our American troops. LtCol. 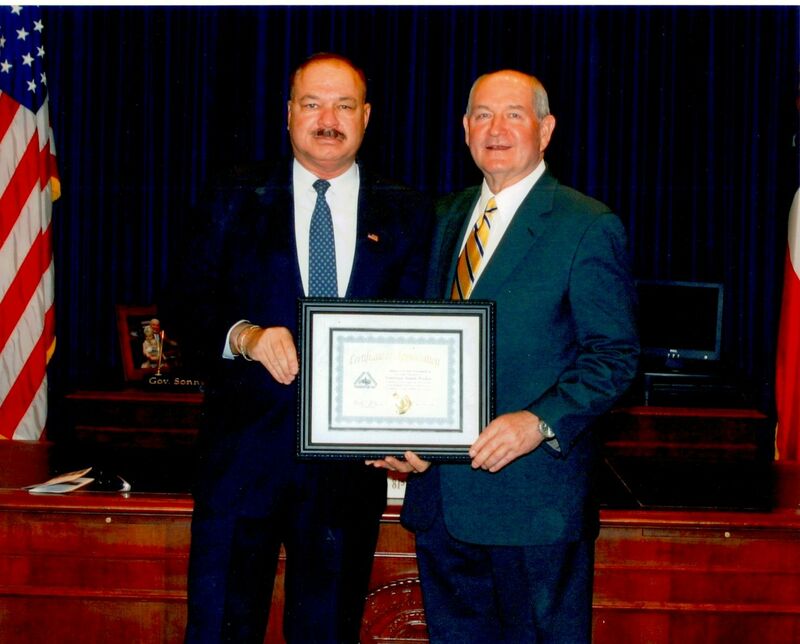 Robert Ledee, President of Armor 4 Troops Foundation, is proud to present to Georgia Governor Sonny Perdue pair number Fifteen Hundred (1,500) of protective anti-ballistic eyewear which is being provided to our American troops. LtCol. 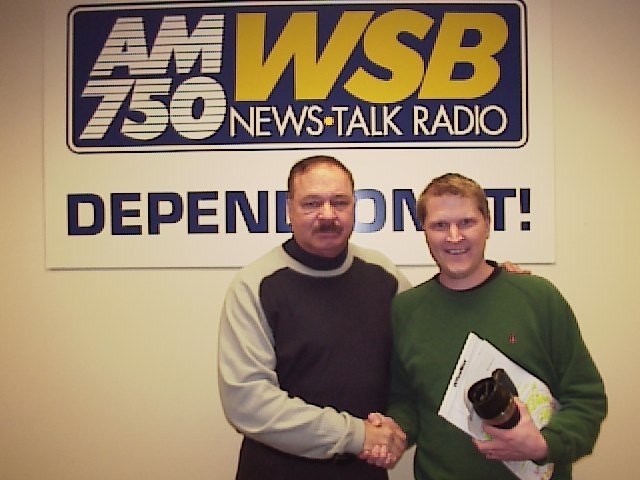 Robert Ledee, President of Armor 4 Troops Foundation, wants to personally thank and expressed his appreciation to Kris Krok, WSB-Radio, AM750 Atlanta for the opportunity of appearing on his show. LtCol. 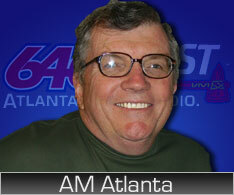 Robert Ledee, President of Armor 4 Troops Foundation, wants to personally thank and expressed his appreciation to Tom Hughes, WGST-Radio, AM640 Atlanta for the opportunity of appearing on his show. LtCol. Robert Ledee, President of Armor 4 Troops Foundation, presents to MajGen. 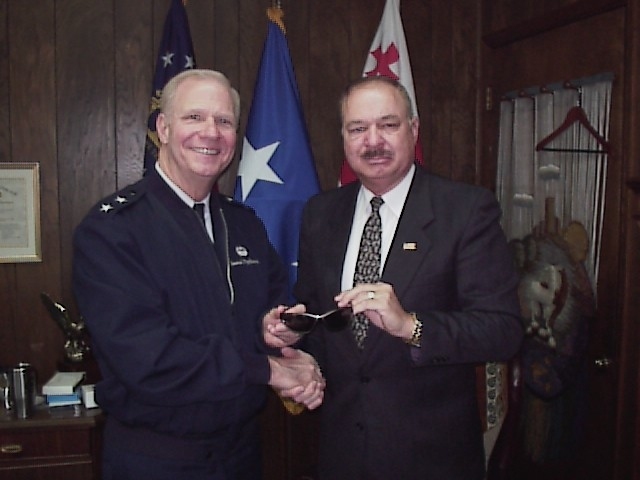 David B. Poythress, The Adjutant General, Georgia Dept of Defense, pair number fourteen hundred (1,400) of protective anti-ballistic eyewear which is being provided to our American troops. I wanted to take a little time out to say Thank You from Iraq. I received the anti-ballistic protective eyewear and Under-Armour that you sent just prior to my deployment in January. I want to let you know how handy they have been already. The Under-Armour is a life saver during these cold nights and hot days, and the glasses have proven to be much more comfortable and functional than what was issued. It’s good to know that there are a few folks who do more than display a yellow “support our troops” ribbon on their car. Thanks for backing up the talk!! Your work and efforts is very appreciated by all of us here. I think you all are doing a great service for our soldiers. We are stationed in the forgotten country of Afghanistan, serving in a forgotten war. It seems that we are the other war and we always hear the main effort is in Iraq. That is hard for us to accept since this is pretty real for us right here. I saw what you are doing and believe it is a great thing. It is a shame that it has to be done this way and the necessary material and equipment is not provided for us to complete our mission by those that sent us here. I am proud to serve in this military and I believe we are the best in the world. What we are doing here is making a difference and everyday we see it in the eyes of the children. From those of us in the 209th Corps, RCAG-N located in Mazer-E Sharif, I would like to express our sincere thanks for what you are doing. I wanted to write and thank you for the ballistic glasses you sent me. Its so nice to know that there are people like you who care about us over here. I'm sure you know how hard it is to be away from all your friends and family. Then to be here and its so hard to get things you really need. The glasses are such a huge help. Thank you again!! What you all are doing for us means so much. There was nothing I could have done to prepare myself for deployment. And Baghdad is nothing like I thought it would be. I'm looking forward to taking mid tour leave hopefully in May. And I should be back in Texas for good maybe in Dec. or Jan. I know its only March but I cant wait!! But anyways, I don’t really have a lot of time on the computer as I'm on tower guard today. So thank you for everything!!! 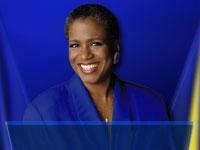 I personally want to thank and expressed my appreciation to Joanne Thompson for the opportunity of appearing on her show. Robert, thanks for the note. I have recommended your eyeglasses to everyone I have talked to since we received them. I was not going to take a pair, but the unit that we gave them to gave me one as part of their "team", and they are great glasses, so again, thanks very much. If I can do anything to help, please let me know. First I would like to thank you for all of your help to the troops who are serving. Reason I am writing is my husband is home from Iraq he was hurt while on patrol, He is a SGT in the U.S. Army and loves what he does, he was hurt by a IED he took a blast to his chest and face if the army would have gave him the proper equipment he would have not been so hurt, his squad has to pass what little equipment around during the patrol 7 vest for 10 people, and being an NCO, he will always take care of those under him. His men under him love him for what he does and the leadership he shows. Which is why I am writing you he is going to be sent back there and he wants to go so he can make sure his men come home. I and scared that he will go back and face the same problem and I can not afford to buy him what he needs: body armour and eye protection, if there is any thing you can do please let me know I do not want him to get hurt again. He only has 3 years to go before he retires. He leaves again in 3 weeks if you can not help that is ok you do so much anyway and if you help just one you are blessed and for that I thank you. Hi. My name is Jeremy S. I am the soldier in Iraq that you sent a package to from Mike and Susan Roberts. I just wanted to let you know that I received the package the other day and thank you. I am really thankful for it. Thanks again. 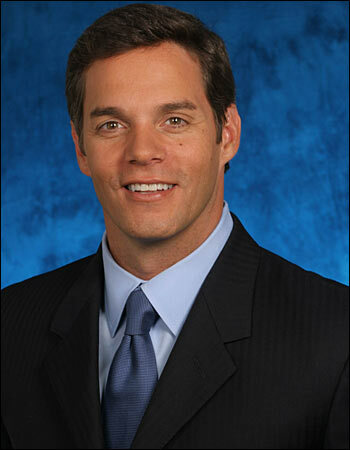 I personally want to thank and expressed my appreciation to Bill Hemmer for the opportunity of appearing on his show. From: Mark & Maryjane S.
I would like to thank you from the bottom of my heart for having sent enough ballistic eyewear to our soldier son & his squad. Their missions takes them thru out the country of Iraq & from a mother's point of view, anything that can add to their safety is greatly appreciated. We wish your organization continued success & we are telling everyone about your group. I would like to thank you and your staff for the package I received a few days ago. The Under Armour, eyewear, multi-function tools and all of the great amount of products you sent me is overwhelming and are a great surprise. We have been asking our families for this equipment and realize how expensive it is. Thank you so much and I will be in your debt and will call your office upon my return next year. My unit is contacting and requesting their families to call and support your organization. God bless you!! I just want you to know how much I appreciate you and your organization. It's a comfort to know there are people who truly care about our troops, and use their time and resources to go the "extra mile" for them. Thank you for the anti-ballistic glasses, and the Under-Armour shirt (a nice surprise). My son will put them both to good use. PS. His good buddy was killed in Fallujah on Saturday. I truly appreciate the package that Armor 4 Troops Foundation sent to me in the mail. Honestly, I did not know about the package until my mother had told me about it. I was upset that the original got mixed up. I was actually on leave when I found out so I had my wedding and family on my mind, to be honest with you. I just wanted to say thank you for your support and all the items in the package. I would like to thank you for the protective eyewear that you have sent on behalf of my parents. I am know that the package was sent about a month ago, but the post office here failed to let me know that it had arrived until today. I hope all is well for you and your family. Wanted you to know that I just found out from Tyler that your package did indeed arrive a few days ago. Tyler was delighted to receive it and thanks you immensely. He said that it was wonderful to have a clean, warm shirt. Loves the utility tool, which he put on right away, and replaced his goggles with the eyewear you sent. His goggles were fogging up and the ones you sent do not. He said that one of the officers told him he couldn't wear them, but Tyler said a Marine Colonel had sent them to him, they were of superior quality, and he was going to wear them. Guess the officer thought it was okay after he heard that! I want to thank you for the package I just received today. It will be useful to me and the loose fit was just right. I also want to thank you for your time and service in the USMC. Being over here made me realize how hard times can be and can just imagine what it was for. I can insure that everything in the package will be put use and as for the movies myself and others here with me will enjoy the movies. As for the "anti-fragmentation" eyewear no one in our company received them. Last I had heard they wasn't going to issue them out until there was enough of them to pass out. Well my time on the computer is about up so I have to make short. Thank you again and I would be honor to accept the invitation for lunch. Thank you all so much. I'll make sure the guys will get all their stuff. We've been pretty busy lately but thank you and god bless. I personally want to thank and expressed my appreciation to Monica Kaufman for the opportunity of appearing on her show. From: SPC. 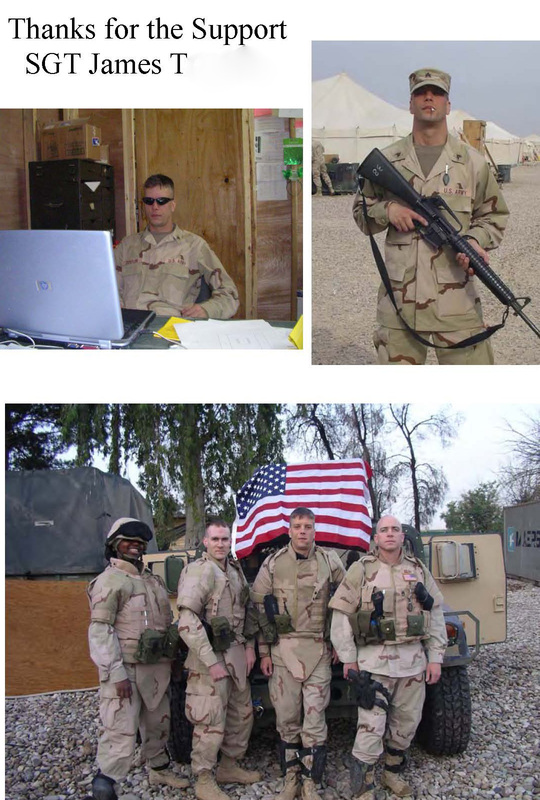 Chad A. P.
I wanted to personally write to you and tell you how much I appreciate all that you have done for me, as well as all the soldiers you have helped. Thank you!! I use the under armor & ballistic shades all the time. With the temperatures reaching 120 degrees, then another 20-30 degrees with all the gear and equipment, the under armor makes it a little cooler. Being here makes me realize how good we, as Americans, really have it. I just spent a month working at an Iraqi Army compound, and let me tell you, the freedoms & our way of life is precious. We’re making history every day here, but it’s going to take time to get this country turned around. The 8 soldiers that were killed by IED’s a couple of months ago…we had to drive that road to and from Camp Stryker. I’ve seen the pictures of the vehicles involved, a 113 and a Humvee. Both were hit with 500 pound bombs buried under the asphalt. It blew a 19 foot radius, 6 ft deep hole. The Hummer was blown in half. We’re now back at Stryker making preparations to move south. Knowing people like yourself & the people you are working with are supporting us & our cause, is appreciated in ways nobody here can express in words. I look forward to meeting the staff when I come home in November and personally thank all of you. Before long, we will be home & this will be a page in my life that will be behind me. 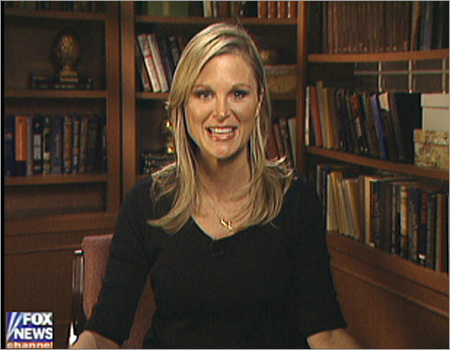 I personally want to thank and expressed my appreciation to Juliet Huddy for the opportunity of appearing on her show. I just picked up your package this morning at the Post Office and handed the stuff out to the boys. They loved the knives, and wanted me to express their appreciation. I told them I would, but that I wanted them to write you themselves and thank you, so I am taking your email address in tomorrow, I forgot it this morning. We have been very busy at work, running 1,000 MPH trying to get everything done, so I have not had to much of a chance to write or find any new pictures to send. I have not forgotten. Well, I still have things to do so I will close for now, again, thanks. Take care. Thank you so much for what you are doing, for the troops. My Son-in-Law wears a large, and if you could send a couple extra protection items to keep sand out of their face that would be great. When I asked the other day what I could send to him and a few of his buddies, the request was Boxers, AA batteries and the face protection. I also sent some crossword puzzles and magazines. I know that's not a lot, but if we all do a little it will turn into a lot. Just like the two fish and 5 loafs for bread. I will pass all this information on and will CC you as well. deployment any more bearable. If you would please reply back to me whenever you can and let me know what it is that I need to do on my part. Any help that you can give would be greatly appreciated. That Under Armor gear would be greatly beneficial and there is NOWHERE out here to purchase any at all. Thank you for your generous offer to send under armor to my son, Nick, who is serving with the 48th brigade. He took two shirts with him that he purchased with his own money. As far as I know he has not been issued any by the army. Every time I have seen someone from your organization collecting money for our troops overseas I have given money. I know that this benefits our troops and now you are proving this by helping to support my son. In some of our conversations he has commented about the heat. One time he said that it was 120 and that in his uniform with all the packs and bullet proof vest he must wear that it was much hotter. One day when he came in he had heat blisters all down his chest from wearing all that he needs to protect himself. God bless you and thank you for all the help you and your organization provide for our troops overseas. About a year and a half ago I happened to be coming down the exit off of Town Lake Parkway and saw you taking up donations. I was very proud to see someone volunteering their time for such a good cause. Now, a few months later, my husband has been called to Bagdad as part of the Gainesville Infantry Unit. He will be there for a whileand has been there for about 3 months already. I read all about what your time and effort has contributed to so many soliders already. I give everytime I see you at the Wal-Mart. I hope that you continue to do what you do. I really appreciate you. Anything to make the lives of our soliders better and safer is well appreciated. Alex, my cousin, has put me into contact with you. My name is SFC H., Jerry; I am a Platoon Sergeant with 1st Plt, B Co, 2-502nd Inf Regt, 101st ABN Div (AASLT). I would like to start with expressing my many thanks to you and your organization in all that you do, have done, and I am sure will do in the future for our men and woman fighting overseas. I would like to also thank you for the protective eyewear that Alex has passed on to me. Protecting our eyes is ONE of many challenges facing my boys as we are preparing to return to Iraq here in the very near future. As we return and begin operations, I would like to support you and your organization in any way I can. I would like to send pictures and testimonials from myself, and the boys of 1st Plt, using the items that you have provided. If there is any way, I would like to be able to receive additional protective eyewear for the rest of 1st Plt, again, this would be greatly appreciated. I have 36 young men returning to Iraq with me. For a few of us, this is our second rotation. This email address is one of the ways I can be contacted, it will be the address I will be using while deployed. To give you an example of the current situation, I have personally spent over $1,200 in the last month to procure additional body armor. I will close for now, and I would like to one last time thank you for everything you have done. Donna and I spoke to Nick this morning and he has received the package you sent. He and his unit thank you for your generosity and cause, and are totally "psyched" (their word) about the glasses. Nick is almost as happy to get the goggles as the glasses and says that they are superior to anything previously issued. They plan to take a photo to send you. Donna and I wish to send our sincerest thanks for your outstanding and unselfish commitment. We appreciate and applaud your efforts. Keep it up. My name is Petty Officer Daniel S. I think you met my brother Steve and he told you about me going back to Iraq here shortly. So you sent him some glasses. Well I received the glasses and I just want to say I appreciate that so much. To me that is like receiving a pot of gold. My position on my team is humvee #1 50 cal. gunner. So believe me these glasses are sweet. I'm just writing to tell you thanks very much and you mentioned something about under armour shirts. I would love that. So if you get a chance to send me some that would be great. The shirts need to be brown. Size large in the loose gear and xl in the tight gear. I think they call it heat gear and cool gear. If you got any masks or anything for wind that too. If you would. gloves will work too. Whatever you can do let me know. I leave for Fallujah, Iraq pretty soon. So the sooner the better. E-mail me back and let me know whats up. Thank you so much. I would like to thank you and your staff for the package I received a few days ago. The Under Armour and the personal necessity items are a great surprise. I do know that it has been 120 degrees plus and the gear is a welcome surprise. I think you got my information from my wife Kelly. Thank you again and I look froward to coming home soon. The support you folks have shown, make it worth the hardships we face. From: MSgt Albert M. G.
Think you had a bad weather day? Thank you so very much again for all of the wonderful things that your company provided to us out here. Its tough being constantly away from home and loved ones but, with the support and prayers from men like yourself and so many other gracious Americans, it only reinforces our resolve to do what has to be done. 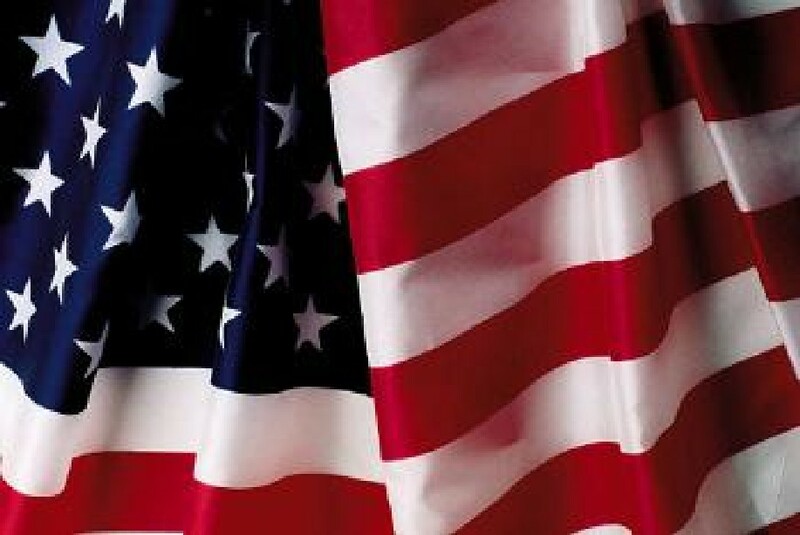 May this Memorial Day holiday find you and yours blessed with good health and prosperity for all. 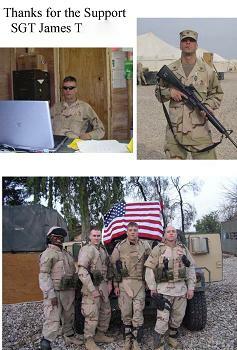 From: MSgt Leonard F. C.
My name is Maj. Jeffrey L. W. with the 122nd Corps Support Group, S4 Officer stationed in Iraq. I am writing you to thank you so much for the care box given to me through my cousin Teresa McCraw from Atlanta, GA. I shared the items with my troops and they wish to say thanks also. We are stationed in southern Iraq which is the hottest part of the country. The Under Armor T shirts and sunglasses definitely will come in handy. We have already experienced temperatures in excess of 118 degrees and expect 130-140 in the dead of summer. I appreciate your support of the troops and what the Armor 4 Troops Foundation stands for. It's good to know that people like you stand behind our troops in this fight for freedom. Thank You for Your Support!! The Armor 4 Troops Foundation is proud to announce its alliance with and support of U.S. Vet Aid, Inc.
We encourage you to visit their website at www.usvetaid.org to learn more about them and to keep abreast of events scheduled in your area. The Armor 4 Troops Foundation applauds the progress that U. S. Vet Aid, Inc. has made in their organization and we invite you to join us in supporting them in the development of their upcoming series of concert events, as well as wishing them every success in all of their future endeavors. The Armor 4 Troops Foundation is proud to announce that it has achieved a Foundation milestone of exceeding two hundred (200) pairs of protective anti-ballistic eyewear being provided to our American troops. 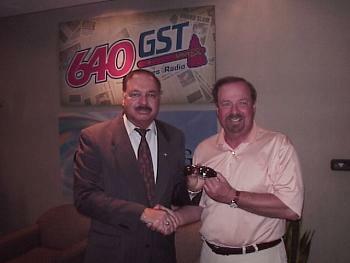 Pictured below is Lt. Col. Robert Ledee, President of Armor 4 Troops presenting the honorary pair number two hundred (200) of anti-ballistic eyewear to nationally recognized radio talk show personality Kim the “Kimmer” Peterson of WGST AM 640, Atlanta, Georgia, for all of his support of our American Heroes. The Armor 4 Troops Foundation went on to ship an additional thirty-two (32) pairs of anti-ballistic eyewear to one of the “Kimmer’s” adopted Companies of Heroes, the "Flying Tigers" of “C” Company, 8-229th Attack Helicopter Battalion currently stationed in Iraq. Note: The Armor 4 Troops Foundation is truly grateful to the “Kimmer” and his “on-air” sidekick Wayne “No Offence” Kitchens for their generosity and loyal support. I wanted to thank you so very much for all the wonderful things that you and your people have sent to us over here in Iraq. Everything was absolutely wonderful and we really appreciate the thoughtfulness of the terrific gifts. I hope that someday I am able to repay your kindness and generosity to you. Thank you again Sir for everything. Ten pairs of anti-ballistic protective eyewear was presented to the U.S. Immigration and Customs Enforcement team of the Department of Homeland Security in Atlanta, Georgia. I am writing to thank you for the generous gifts you and your organization have sent to HMM-264. The Gerber’s and sunglasses were very much appreciated by the members of the shop. More importantly the support your organization has shown to our unit make the burden of being deployed much easier to bear. The Armor 4 Troops Foundation sends the fourth of four packages of protective eyewear, emergency multi-tools under armor-armor and personal gear to members of Marine squadron HMM 264 stationed in Iraq. Let me first thank you for the wonderful support and prayers that you provide for us and all troops. I am Master Sergeant C., the direct supervisor for Sergeant S. He has received your boxes, and the items are well received and put to good use. It is truly amazing what a few things from home will do to perk up the morale of the young troops, as well as the older ones like myself. I also wish to extend my personal thank you for the items. As a lover of popcorn, I will never be left wanting for some. The Leatherman tools were the most pleasant surprise, and will serve us long after we leave this area. I have placed mine in my “hit and run” bag for when I fly. I am fortunate to be able to lead such great Marines in today’s battle and I am profoundly proud of them and their accomplishments. It is with the love and support of such great people and organizations such as yours that we will persevere and come home victorious. Thank you very much for your support. My fellow Marines and I have been enjoying the packages immensely. The Leatherman multi-tools and sunglasses were especially nice. The guys here love you all for it. I just wanted to express my appreciation to you personally. There will be other Marines, who are probably better at writing and speaking, sending you thank you letters. Thank you once again. Daniel V. S. Sgt U.S.M.C. The Armor 4 Troops Foundation sends the third of four packages of protective eyewear, emergency multi-tools and personal gear to members of Marine squadron HMM 264 stationed in Iraq. The Armor 4 Troops Foundation sends the second of four packages of protective eyewear, emergency multi-tools and personal gear to members of Marine squadron HMM 264 stationed in Iraq. The Armor 4 Troops Foundation sends the first of four packages of protective eyewear, emergency multi-tools and personal gear to members of Marine squadron HMM 264 stationed in Iraq. Additional protective eye-wear and personal gear issued to members of the Georgia National Guard. Armor 4 Troops Foundation officially approved by the I.R.S. as a 501 (c) (3) tax-exempt charitable organization. Lt.Col. Ledee was pleased to present an additional twenty-two pairs of tactical combat anti-fragmentation goggles to "B" Company, 108th Armor Brigade of the Georgia National Guard at the Army Reserve Headquarters in Macon, Georgia. Accepting on behalf of "B" Company are Majors Collins and Snowden of the 108th Armor Brigade. Today was the initial deployment date of "B" Company, 108th Armor Brigade of the Georgia National Guard, to Iraq. Saddened but proud families and friends, as well as City of Canton, City and County of Woodstock, Georgia officials gathered to pay tribute and give a rousing send-off to the brave young soldiers of "B" Company and to wish them the very best during their tour of duty. Lt.Col. Ledee, President of the Armor 4 Troops Foundation was present at the ceremony in order to pay our personal respects to "B" Company, and to present the very first of the twenty-six pairs of tactical combat anti-fragmentation goggles that we will be providing to our American troops. Yes I Would Like to Help! 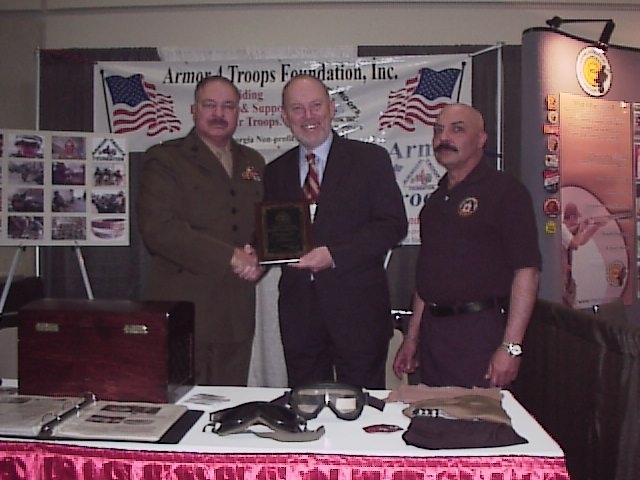 Recognizing and commending the Armor 4 Troops Foundation, Inc.; and for other purposes. WHEREAS, this organization had developed a simple plan of action that has proven successful in providing needed equipment to our troops in the field. NOW, THEREFORE, BE IT RESOLVED BY THE SENATE that the members of this body recognize and commend the Armor 4 Troops Foundation, Inc., and their outstanding efforts to provide crucial equipment and aid to our American troops. The Armor 4 Troops Foundation would like to take this opportunity to say "Thank You" to GA. State Senator Chip Rogers for his kind words and support while addressing the GA State Legislature. 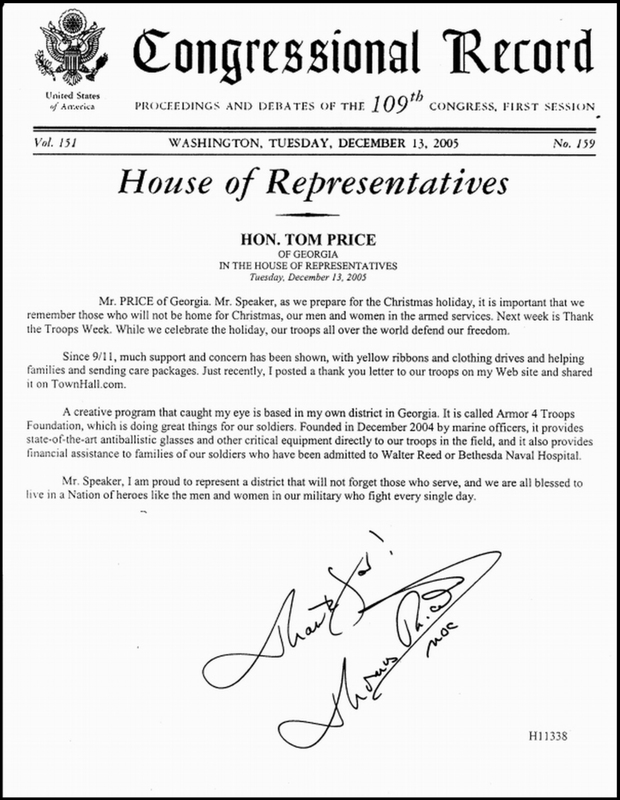 Armor 4 Troops Foundation is very honored and humbled to be included in the official Georgia State Record of our great state. When ordering, be sure to select "Armor 4 Troops Foundation" as the referral so the appropriate credit can be given. The Armor 4 Troops Foundation would like to take this opportunity to say "Thank You" to the Cobb County Republican Women's Group for their generous contribution in support of all our troops fighting overseas in Operation Enduring Freedom. A plaque was awarded to Ms. Holly Comer, President and to the members of the organization. The Armor 4 Troops Foundation would like to take this opportunity to say "Thank You" to WileyX Eyewear for their very generous contribution in support of all our troops fighting overseas in Operation Enduring Freedom. The Armor 4 Troops Foundation would like to take this opportunity to say "Thank You" to Congressman Tom Price for his kind words and support while addressing the United States Congress. Armor 4 Troops Foundation is very honored and humbled to be included in the official Congressional Record of our great country. Armor 4 Troops Foundation was honored by the Cobb County Republican Women's Club for the great work in supporting our American troops fighting overseas in Operation Enduring Freedom. Armor 4 Troops Foundation is very proud and excited about receiving this honor. It is a tribute to all the hard working volunteers who work tirelessly and without compensation in support of our troops. 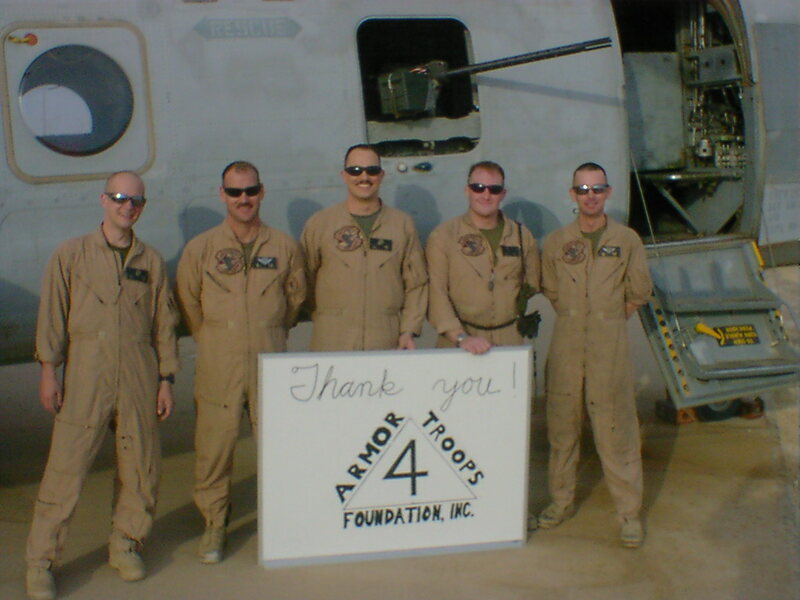 The Armor 4 Troops Foundation would like to take this opportunity to say "Thank You" to everyone at the First Baptist Church of Woodstock, Georgia for your prayers and support of our American troops. Your generous donation will go a long way in helping to provide protective eyewear, clothing, personal gear and spiritual comfort to many of our American Heroes. On their behalf, we thank all of you for your support! The Armor 4 Troops Foundation would like to take this opportunity to say "Thank You" to everyone at the Walnut Avenue Wal-Mart Super Center #669, of Dalton, Georgia, for their generous support of our American Heroes. It is a privilege to be associated with such a fine company and all of the wonderful and generous people who comprise the fabric of this organization. On behalf of all of our American Heroes, we thank you, salute you and send all of you a special Wal-Mart cheer filled with plenty of "Squigleys". 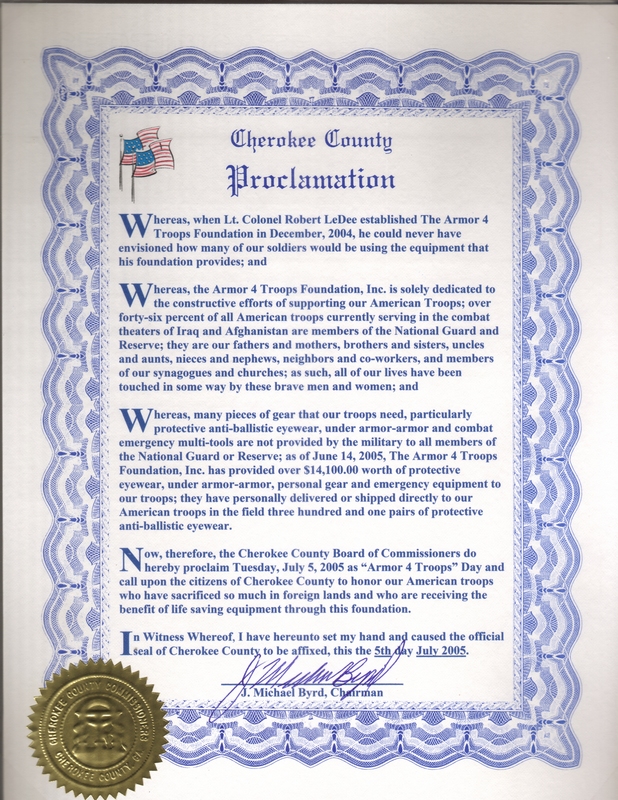 The Armor 4 Troops Foundation was honored by Cherokee County, Georgia today, when June 5, 2005 was declared Armor 4 Troops Foundation day. We are truly proud to accept this award on behalf of all of the patriotic donors who have have shown such honor and generosity to our American troops who are defending our Freedom! 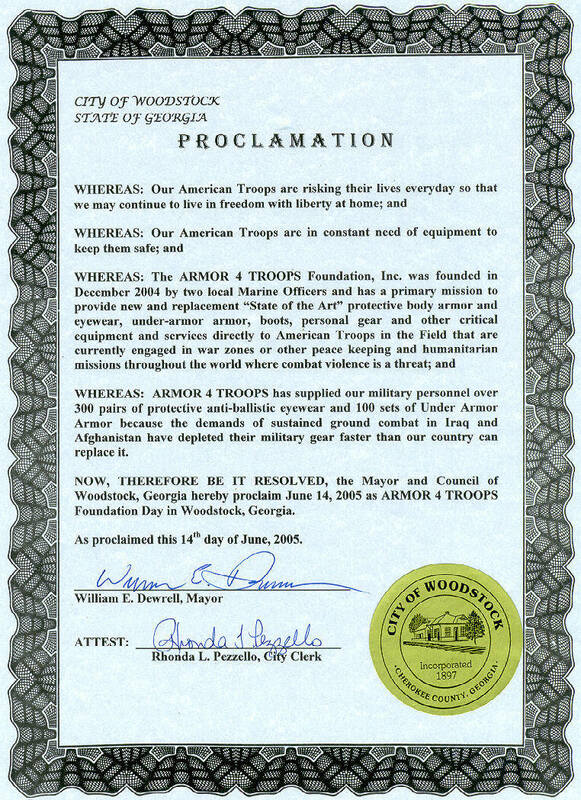 The Armor 4 Troops Foundation was honored by their hometown City of Woodstock, Georgia today, when June 14th, Flag Day, was declared Armor 4 Troops day by Mayor Bill Dewrell and members of the Woodstock City Council. We are truly proud to accept this award on behalf of all of the patriotic donors who have have shown such honor and generosity to our American Heroes who are defending our Freedom! The Armor 4 Troops Foundation would like to take this opportunity to pay tribute to everyone at Frank Betz Associates, Inc. of Smyrna, Georgia, for their continued support of our American Heroes. We consider it a privilege to be associated with such a fine company and all of the wonderful and generous people who comprise the fabric of this organization. On behalf of all of our American Heroes, we thank you and we salute you! Memorial Day is a solemn, yet sad occasion honoring the American soldiers who gave their lives in war. It is also a hallowed day, because the values those Heroes fought to defend form the essence of our country, freedom and the rights of the individual. 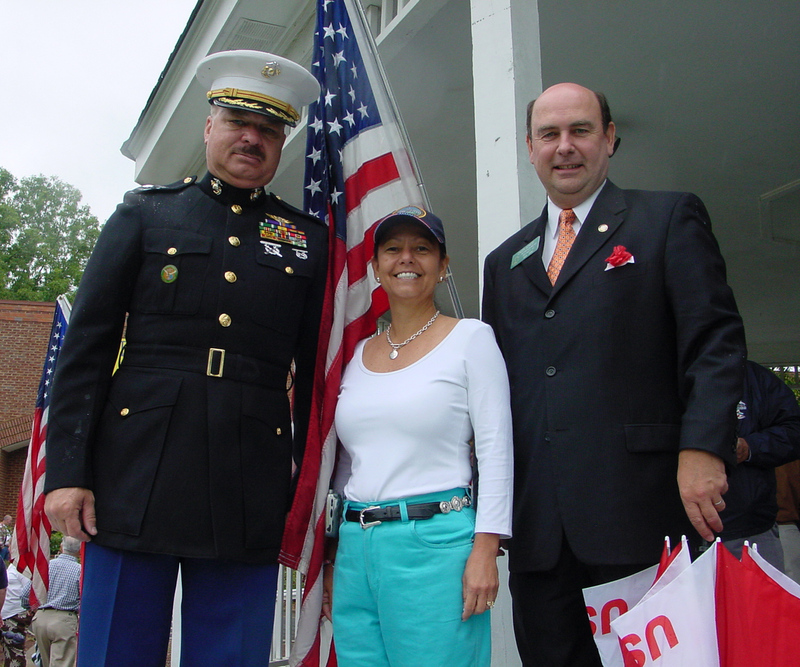 In a time when so many of America's public officials pay nothing more than "lip-service" when it comes to honoring our Fallen Heroes, it is with great pride that the Armor 4 Troops Foundation invites all of our visitors to join us in saying "Thank You" to State of Georgia Representatives Charlice Byrd, District 20 and Chuck Scheid, District 17 and Woodstock, Georgia Mayor Bill Dewrell for their genuine respect and continued support of all of our American Heroes and their families, both past and present. LtCol Ledee was "Guest of Honor" for the City of Woodstock festivities. 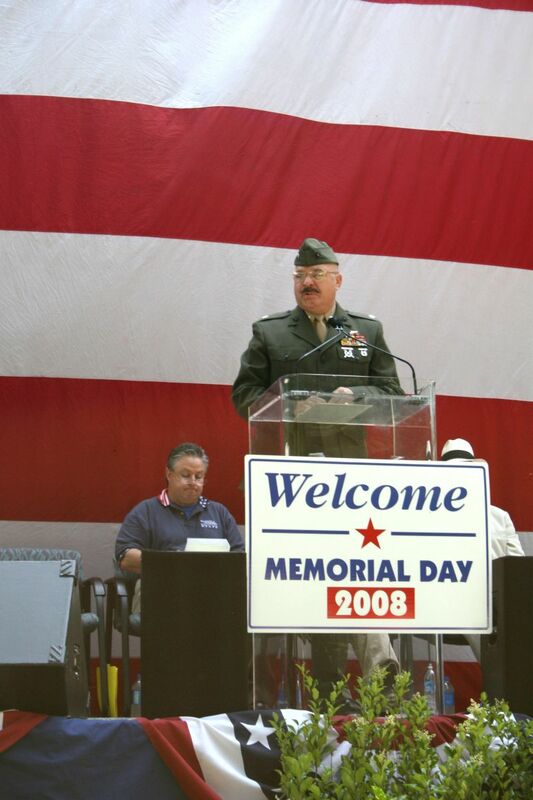 Each of these leaders felt that it was more important to take the time out of their busy schedules to join with hundreds of patriotic American citizens on Memorial Day, 2005, (in very wet weather, by the way) to honor and pay their respects to our Fallen Heroes, than it was to find an excuse to just take the day off for personal pleasure. A breath of fresh air, don't you think?! The Armor 4 Troops Foundation would like to express its deep appreciation to everyone at Real to Reel Studios of Jonesboro, Georgia for their generous contributions and unwavering support of our American Troops. On their behalf, we thank you. The Armor 4 Troops Foundation would like to express its deep appreciation to everyone at the Wal-Mart Supercenter #0937 of Marietta, Georgia. We were truly honored to be invited to participate in your Grand Opening ceremony. Your generous donation will go a long way in helping to provide protective eyewear, clothing and personal gear to many of our American Heroes. On their behalf, we thank all of you for your support! The Armor 4 Troops Foundation would like to express its appreciation for the opportunity to address the members of the Marine Corps League at their 59th Southeast Division Conference. We shall look forward to working closely with the Marine Corps League and all of its members in helping to provide protective eyewear, equipment, clothing and emergency field tools to our brave young Marines in the field.